Temporary pavilion provides eating quarters this summer. The renovation, the first in more than 30 years, is restructuring the serving space to emphasize the specialty stations and greater selection that have become increasingly popular, particularly in recent years, and completely reconfiguring the seating area. The work during the summer of 2013 focused on relocating the dish room from the center of the dining hall to the northern space formerly occupied by the dining service offices and also relocating the Phelps resident director’s apartment with the next phase in mind. This summer’s emphasis is on the serving and dining areas. While the dining hall remained open during last summer’s work, is not possible this summer. The temporary pavilion is providing dining space (complementing the Cook Hall servery) for the college’s summer conference guests—the largest group will include 1,800 participants—while Phelps dining hall is off-line. The temporary dining area, called the “Crow’s Nest” by the Events and Conferences staff, features a nautical theme and allows for a flexible dining experience with open sides during the nice weather and an ability to lower “tent” sides in inclement weather. There will be outdoor picnic tables in addition to tables under the roof. Following the completion of the dining-hall project, the temporary structure will be disassembled and relocated near the track and practice football fields for use as a storage building. Phelps Hall was dedicated in 1960, with a major renovation of the dining hall completed in 1980. Student demand for the space has climbed steadily through the years, growing from roughly 1,800 students on a meal plan about five years ago to approximately 2,400 this year. The changes to the serving area will include expansion and greater integration of the specialty-station concept, which has developed in the years since the 1980 renovation. 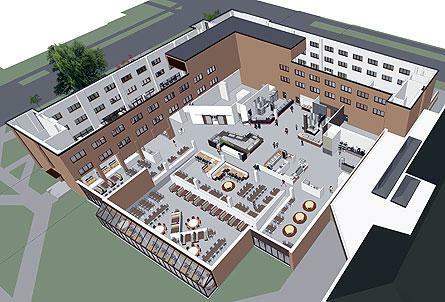 The changes to the seating area will include more seating options, such as booths and raised tables, as well as an expansion into the lounges to the northwest of the dining hall that will enable the space to accommodate 60 more guests. The work this summer will also include completing new offices for the dining service, in temporary quarters since last year. A feature about the project was published in the August 2013 issue of “News from Hope College”.